Lobby Logos Custom Signs Maryland MD | Virginia VA | Washington DC | KERLEY SIGNS, INC. Whether you have an existing logo or not, our professional Design Team will work with you to find the most suitable colors and creative use of space to represent you and your company. Lobby Logos are one of the most diverse forms of signage you can invest in. They can be manufactured of almost any material or a combination thereof. 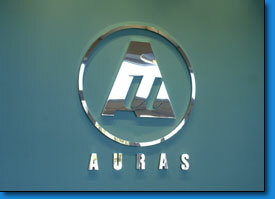 An attractive way to represent your company, lobby logos are a very eye-catching and economical form of signage. Whether you have an existing logo or not, our professional design team will work with you to find the most suitable colors and creative use of space to represent you and your company. Whether or not you want your lobby logo to use artificial light or natural light – such as the Maryland Fire and Rescue Institute - our team will work with you to reach the most successful and sensible decision. Lobby Logos are one of the most diverse forms of signage you can invest in. These lobby logos usually generate the first impression a potential client will form regarding your business. Using vibrant colors such as gold and silver and a variety of finishes, Kerley Signs is able to create a logo which will represent your company the way it deserves to be represented. The versatility of these custom signs enables us to utilize a variety of materials, helping to create the most effective lobby logo, making this an attractive, eye-catching, intelligent investment. With such a wide variety of options it's no wonder Kerley Signs has been so successful in the Virginia, Maryland, and Washington D.C. area.